This data was compiled by Michael Keane and it includes all trees, not just those located on streets, and relates to the map data available on Google Earth during August 2017. The results are not what might be expected: overall Burngreave is leafier that Nether Edge; Shiregreen & Brightside have more tree cover than Dore & Totley. 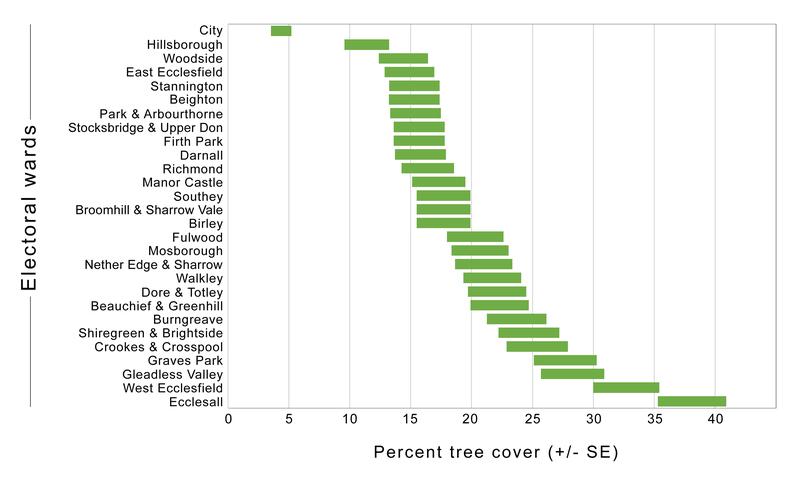 For the Sheffield Electoral ward tree cover survey I used ‘i-tree canopy’. It is free online software that offers a quick and easy way to measure tree canopy and other types of land use in an area. It is fast becoming the standard way to measure tree canopy. You define the area that you are interested and the software shows you random Google Earth images within that area. You have to then decide whether or not a tree in the centre of the picture. The time consuming bit is to view and classify lots of images – typically several hundred. Once you get used to it, you can classify 500 to 1000 images per hour depending on the number of categories you have. The standard categories are tree/non-tree but you can add others like highways, buildings, water, bushes/shrubs, other green spaces etc. For the Sheffield ward survey, I stuck to basic tree/non-tree categories but even so it took 30 minutes per ward (300 sample points each) and there were 28 wards to cover. Hopefully the results were worth the effort. – Michael Keane is a retired civil servant who used to work on National Statistics. He is concerned at the increased use of post truth politics at the expense of hard facts and evidence.